Vancouver, British Columbia – October 7, 2013 – THEMAC Resources Group Limited (TSX.V: MAC– “THEMAC”) announces positive economics, as well as an increase in reserves and resource for its 100% owned Copper Flat Copper - Gold Project located in south central New Mexico. The feasibility study is National Instrument (“NI”) 43-101 compliant and was completed by M3 Engineering & Technology Corp. (M3) of Tucson, Arizona. The Feasibility Study builds upon the Prefeasibility Study published in July 2012 that was also prepared by M3. All amounts below are in United States Dollars and all quantities are presented in US standard units unless stated otherwise. Copper Flat is a former producing mine located in Sierra County, New Mexico, USA, approximately 150 miles south of Albuquerque and 20 miles southwest of the town of Truth or Consequences, New Mexico. The project land package comprises 4,741 acres, with the majority of the mineral reserves located on patented mining claims that are wholly-owned by THEMAC. The Feasibility Study update includes financial analysis on three scenarios with varying metal prices: 1) The base case uses a long term copper price of $3.00/lb; 2) Upside sensitivity case pricing based on a $3.25/lb long term copper price; and 3) Downside sensitivity case pricing based on a $2.75/lb long term copper price. “I would like to thank all involved for their efforts in to completing an excellent study. We are pleased that the results indicate Copper Flat is a viable project. Now that the feasibility is complete, we will be focusing on progressing engineering design works and gaining the remaining permits required to develop the mine.” said Andrew Maloney, CEO. Copper Flat’s proven and probable mineral reserves increased by 15%, or 15 million tons, to 113.1 million tons, when compared to the previous 2012 mineral reserve. This material contains 674 million pounds of copper, 20 million pounds of molybdenum, 308 thousand ounces of gold and 7.2 million ounces of silver, and has an average copper equivalent grade of 0.39%. Copper equivalent factors used account for metal price, metallurgical recovery and smelter payable factors. Listed below are Copper Flat mineral reserves and mineral resources as of April 2, 2013. The total measured and indicated mineral resource (inclusive of mineral reserves) has increased by 35% or 79 million tons, to 305 million tons, when compared to the previous 2012 mineral resource estimate. The mineral reserves and mineral resources have been developed from a computerized block model that is based on a drill hole database incorporating a total of 233 drill holes and 181,326 feet of drilling that continued through to the end of 2012. In addition to the drilling program, the company re-assayed more than 6,000 historical pulps to obtain gold and silver data. The mineral reserve has benefited from additional geotechnical drills holes that allowed the pit wall slopes to steepen due to improved rock conditions. Average cash operating costs, net of [by-product credits] and using the base case pricing scenario, are estimated at US $0.93 per pound of copper produced during the first five years of production and US$1.15 per pound of copper produced for the life of mine. On an equivalent copper basis, cash operating costs average $1.56 per equivalent pound of copper produced over the life of mine. On a cost per ton basis, cash operating costs are estimated at $11.24 per ton processed, excluding by-product credits. Cash operating costs include mining, processing, site general and administration, treatment and refining, and concentrate transportation costs. The total initial capital cost for construction, mine pre-development, commissioning and owner’s cost is estimated to be $372 million. Sustaining capital will total $61 million over the life of the operation. The project is a brownfield redevelopment project in a stable region with excellent access to existing infrastructure. The project will realize savings through the reuse of significant infrastructure, which the project engineers value between $55 to $65 million, that remains from the original mine. Permitting efforts for the Copper Flat Mine have been in process since 2010. Baseline Data has been collected within the mine permit boundary and in surrounding areas over a 12-18 month time frame and included studies of air quality, vegetation, wildlife, surface water, groundwater, cultural resources, geology and soils. Due to the fact that some of the land in the proposed mine permit boundary is managed by the Bureau of Land Management, an Environmental Impact Statement is required. Work on the Environmental Impact Statement is progressing; scoping and public meetings were conducted in January 2012. Efforts are currently focused on finalizing a Draft Environmental Impact Statement which will then be publicized for public comment. Various additional studies have been conducted and are being used to inform both state permit applications and the current federal evaluation process. These studies include but are not limited to socioeconomic benefits of the mine, highway conditions and traffic impacts, geochemistry of the site, and aquifer characteristics. Permitting efforts at a state level are well underway and an air permit was granted by the New Mexico Environment Department Air Quality Bureau in June 2013.
p>p>Management continues to engage with the OSE to secure the appropriate consents and permits for project water rights. As the company progresses its arrangements in this regard, the appropriate disclosures will be made. Copper Flat is a porphyry copper-gold deposit that is located in close proximity to the surface and amenable to open pit mining methods. The pit operations are planned to use standard mining equipment, including: 4 5 , 0 0 0 l b . , s i n g l e p a s s rotary blast hole drills, 19-cu-yd front-end loaders, and 100 ton off-highway haul trucks. The Mine plan includes a mine support fleet comprised of several track and rubber-tired dozers, motor graders, and 10,000-gallon water trucks. 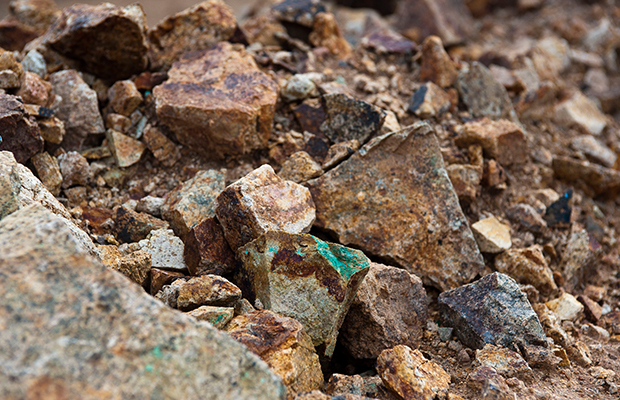 Material mined totals 158 million tons of ore and waste over the life of mine at an average stripping ratio of 0.40 tons of waste per ton of ore. The mining rate peaks at 17.5 million tons of total material per year. 18 months. Following construction, the project schedule includes 11.1 years of ore processing and four years for reclamation and closure. the remainder of the mine life when harder ores are encountered at depth in in the deposit. Copper production is projected to average 70 million pounds per year during the first five years of operation and 57 million pounds per year when averaged over the full life of mine. The Copper Flat ore lends itself to common crushing and grinding practice and standard flotation reagents and the mill is designed to have a simple gyratory crusher and SAG/ball mill grinding circuit followed by a conventional floatation circuit to produce separate copper and molybdenum concentrates. Metallurgical testing shows the Copper Flat ore contains coarse gold that is recoverable through physical separation and gravity separation equipment, this equipment is included in the process flow sheet to improve gold recovery. As a result of metallurgical test work, the expected life of mine recoveries are projected to be: copper 93%, molybdenum 78%, gold 72% and silver 83%. The feasibility study was prepared by M3 Engineering & Technology Corporation of Tucson, Arizona, under the supervision of Conrad Huss, P.E. who is an Independent Qualified Person as defined under Canadian NI43-101. M3 Engineering & Technology Corporation (M3) provides professional EPCM services and is now recognized as an industry leader in Feasibility Studies and associated NI 43-101’s. Since 1983 Independent Mining Consultants, Inc. (IMC) has been recognized worldwide for its expertise in Open Pit Mine Design and Mine Planning as well as Ore Reserve Estimation and Mineral Economics. IMC has worked for large international mining conglomerates, medium sized mines, multiple commodity producers, and exploration firms. Mineral resources and reserves were calculated by IMC of Tucson, Arizona under the supervision of John Marek, P.E., IMC President, who is an Independent Qualified Person as defined under Canadian NI43-101. Assaying for the 2012 drilling program was undertaken at the Skyline Laboratory in Tucson, AZ. Copper and molybdenum values were determined by ICP/MS, gold by fire assay with AA finish, and silver by AA. Reference standards and blanks were inserted in the sample streams, and every tenth sample is being objectively validated by ALS Minerals, Reno, Nevada using similar methodologies. Standard procedures for core handling were in place during the entire drilling program, and a geologist was on site for all sample preparation and shipping. Technical information in this news release has been read and approved by Conrad Huss, P.E. for M3, Jeffrey Smith, P.E., COO of THEMAC Resources Group, Raymond Irwin, P. Geo., Vice President of Exploration for THEMAC and J. Steven Raugust, C.P.G., Resource Development Manager for THEMAC all of whom are and Qualified Persons under Canadian NI 43-101. An Appendix of tables and figures for this news release is available on THEMAC’s website at www.themacresourcesgroup.com. THEMAC is a copper development company with a strong management team which acquired the Copper Flat copper-molybdenum-gold-silver project in New Mexico, USA in May 2011. We are committed to bringing the closed copper mine, Copper Flat, in Sierra County, New Mexico back into production with innovation and a sustainable approach to mining development and production, local economic opportunities and the best reclamation practices for our unique environment. The Company is listed on the TSX Venture Exchange (ticker: MAC) and has issued share capital of 75,300,122 common shares (fully diluted share capital 133,330,134). development activities; employee relations; litigation; the speculative nature of exploration and development, including the risks of obtaining necessary licenses and permits; uncertainty surrounding the availability of water rights required for mining operations which, if not secured, could result in changes to the proposed plan for development of Copper Flat; contests over title to properties, particularly title to undeveloped properties; failure of processing and mining equipment to perform as expected; labor disputes; supply problems; uncertainty of production and cost estimates; the interpretation of drill results; the assumptions upon which the estimation of mineral resources and reserves prove inaccurate, which could lead to a restatement of reserves and resources;; changes in project parameters as plans continue to be refined; possible variations in ore reserves, grade of mineralization or recovery rates may differ from what is indicated and the difference may be material; legal and regulatory proceedings and community actions; accidents, title matters; regulatory restrictions; permitting and licensing; volatility of the market price of Common Shares; insurance; competition; and hedging activities. In addition, there are risks and hazards associated with the business of exploration, development and mining, including environmental hazards, industrial accidents, unusual or unexpected formations, pressures, cave - ins, flooding and the risk of inadequate insurance, or inability to obtain insurance, to cover these risks. Many of these uncertainties and contingencies can affect actual results and could cause actual results to differ materially from those expressed or implied in any forward-looking statements made by, or on behalf of, THEMAC. Readers are cautioned that forward-looking statements are not guarantees of future performance. All of the forward-looking statements made in this press release are qualified by these cautionary statements. THEMAC disclaims any intention or obligation to update or revise any forward- looking statements whether as a result of new information, future events or otherwise, except to the extent required by applicable laws. “Operating cost per pound of copper”, “Life of mine sustaining capital”, “IRR” and similar terms are alternative performance measures. These performance measures are included because these statistics are key performance measures that management may use to monitor performance. Management may use these statistics in future to assess how THEMAC is performing to plan and to assess the overall effectiveness and efficiency of mining operations. These performance measures do not have a meaning within International Financial Reporting Standards (“IFRS”) and, therefore, amounts presented may not be comparable to similar data presented by other mining companies. These performance measures should not be considered in isolation as a substitute for measures of performance in accordance with IFRS.